Throughout the year, the Intrepid Museum Education Department hosts professional development programming for hundreds of teachers. Utilizing the Museum’s rich collection of permanent and temporary exhibitions, artifacts, archives and oral histories, as well as experts on staff, these programs offer a chance for teachers to immerse themselves as learners in a historic environment. While these programs generally serve New York City-area teachers (earning them state continuing education or city professional development credit), this past summer, 25 teachers from across the country participated in the Museum’s first-ever Summer Institute for Teachers, a two-week intensive course funded by the National Endowment for the Humanities. The course, entitled The Cold War through the Collections of the Intrepid Museum, offered history and STEM teachers a deep dive into the technology of the Cold War. It encouraged participants to take a fresh look at the period through new historical perspectives, as well as explore the technological advances that came from the international tensions of the period, such as the Museum’s A-12 spy plane and the nuclear missile-carrying submarine Growler. In November 2018, as part of the celebration of the 75th commissioning anniversary of the USS Intrepid, the Museum’s Education Department partnered with the Institute on World War II and the Human Experience at Florida State University for a full-day study of World War II. The program brought World War II scholars together with 60 teachers to discuss the stories of the men who served on Intrepid weaving them together with the overall war experience. A keynote address delivered by Kurt Piehler, Associate Professor of History, Florida State University and director of the Institute, offered an overview of the experiences of combatants and civilians during World War II. Edward J.K. Gitre, Assistant Professor of History at Virginia Tech, presented his NEH-funded digital transcription history project, The American Soldier: A Collaborative Digital Archive. The project empowers students to connect with historic artifacts in an authentic way, which in turn gives them an unparalleled perspective on war, the soldier’s experience and modern American history. Alison Reilly, a PhD candidate at Florida State University, presented her research on the 1937 Degenerate Art Exhibition in Hitler’s Germany and counterpoint exhibitions throughout the war period at the Museum of Modern Art, spearheaded by Director Alfred H. Barr Jr. 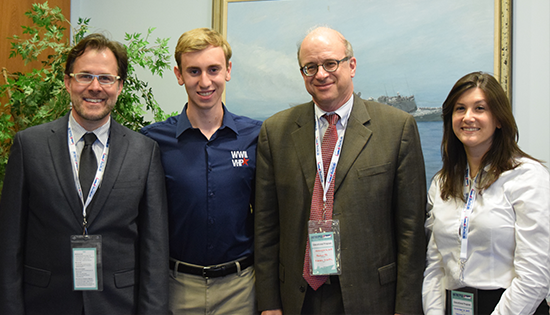 Independent scholar Benjamin Mack-Jackson, also introduced his World War II Veterans History Project, which aims to educate and inspire the next generation to better understand and appreciate the sacrifices made by the Greatest Generation. During the event, teachers participated in guided tours and workshops centered on the theme of storytelling, and worked with Intrepid Museum educators to experience what it might be like to curate their own exhibition by further exploring object packages culled from the Museum’s collection of World War II artifacts. Participants were also introduced to the Museum’s oral history collection, which gave them the opportunity to hear from veterans who were onboard Intrepid when it was struck by kamikazes during World War II and helped make concrete connections to events that happened over 70 years ago. 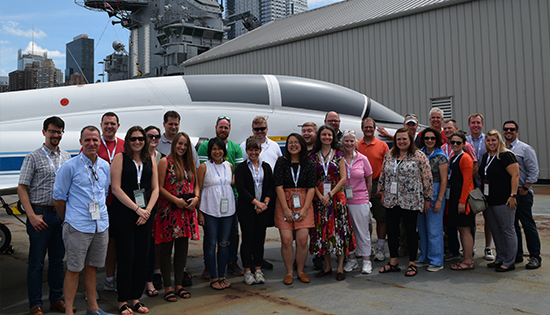 Teachers who attend professional development programs at the Intrepid Museum come away with new methods to teach content in their classrooms and a renewed sense of how they can connect to a National Historic Landmark right here in the city. Helping teachers renew and refresh as learners to better serve their students is just one way we fulfil the Museum’s mission to honor, educate and inspire. “I had the pleasure of attending a previous program at the Museum…I love this place and this stuff!” –Brian Livingston, 9th/10th grade teacher.